France warned its citizens in Chad to be extra vigilant after its fighter jets struck a heavily-armed rebel convoy aiming to destabilise President Idriss Deby. French warplanes destroyed about 20 pick-up trucks in a third day of air strikes after Deby asked Paris for support. France sees him as key to a wider regional fight against Islamist militants. “Given the air operations which the French military are carrying out in north-east Chad and to prevent any malicious act against them, French nationals are urged to be more vigilant,” the embassy said in a message to its 1,500 citizens in Chad. The strikes, which started on Sunday, come as Chadian rebels increase activities in southern Libya after vowing last year to overthrow Deby. 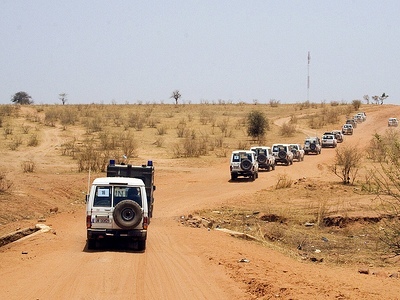 The Union of Forces of Resistance (UFR), a rebel Chadian coalition created in 2009 after almost toppling Deby, said it was behind the incursion, which saw some 50 pick-up trucks drive almost unopposed more than 600 km into Chadian territory. “Bombings are continuing. Several dozen vehicles have been destroyed and there are many seriously wounded,” a senior UFR official told Reuters, declining to say how many had died. Army spokesman Patrik Steiger said there were no French air strikes on Thursday and the military was assessing the state and intentions of the convoy. A statement after a Chad government meeting said Deby informed ministers “the column of mercenaries” was completely destroyed. Deby faced several rebellions since seizing power in 1990 in a military coup. International observers questioned the fairness of elections that kept him in office and last year he pushed through constitutional reforms that could keep him in office until 2033. France intervened in 2008 to stop the UFR toppling Deby, but President Emmanuel Macron wants a new relationship with France’s former colonies and the era of propping up leaders is over. The incursion, which Chadian troops initially attempted to stop, underscores how Deby’s fight against Islamist militants in the region strained his military and hit the oil-dependent economy, leading to growing dissatisfaction in one of the world’s poorest nations.